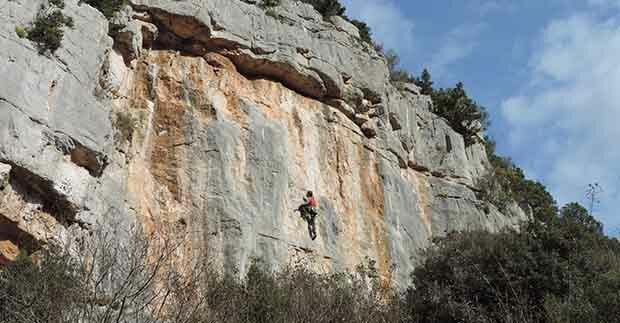 There are 40 different crags in the region, each with its own distinct features. Here is an overview of the most popular ones. Not everything has to be hard and record breaking. Hey, even the elites like to chill in a more vertical terrain on a nice sunny exposition sometimes. That being said, ČRNI KAL is a perfect playground for beginners. Most of the routes are easy and perfectly bolted, making it easy to learn how to lead climb, belay, use your feet and gather some climbing miles. You can climb more intensive routes on the vertical walls around the old tower or shorter ones in the shade of oak forrest nearby. The right side offers true endurance testpieces, though still in the 'easy' range. OSP neighbors Misja pec, but it is not as hard, with routes for every kind of climber. The upper wall overlooking the lovely village is more beginner friendly, although the routes here are also up to 40 meters long, yet not as overhanging. You can learn to climb on tiny crimps or big fat tufas here. It’s a perfect introduction to the region! The wall below is just behind the village and is also full of great technical routes for semi-advanced climbers. In any case, you won't run out of routes here and in the fine weather you may just prefer to sunbathe on some ledge tohether with local lizards. 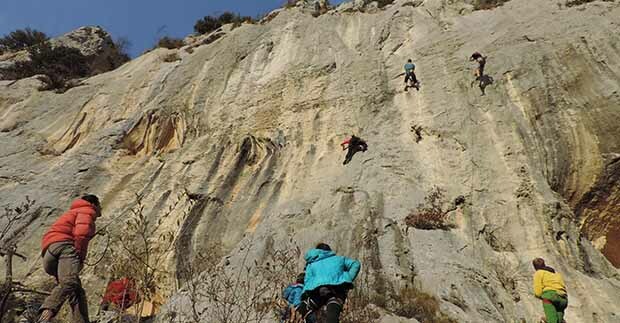 MISJA PEC is a one-of-a-kind, horseshoe shaped crag that is among the best in the world in the sheer numbers and quality of routes in high grades. 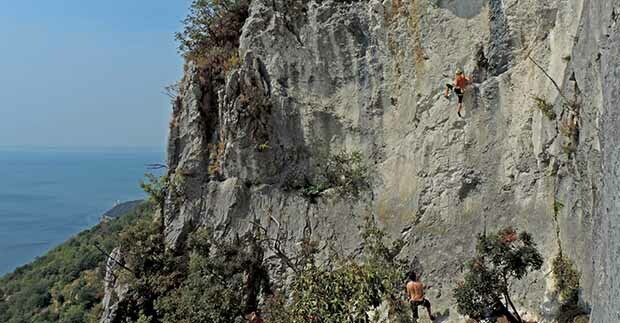 A 9a+/b from Ondra, a handful of 9a’s, dozens of 8’s and even more 7’s – many of them among the most climbed routes in the world within their grade. Luckily it has some routes even for beginners, but only for a day or two. You can climb here in the hardest rain. There’s always a climbing show here, hard routes being climbed, long falls being taken and children, future world champions, playing in the sand below the wall. OSP- Luknja is one of the highlights of the region, especially for strong climbers. 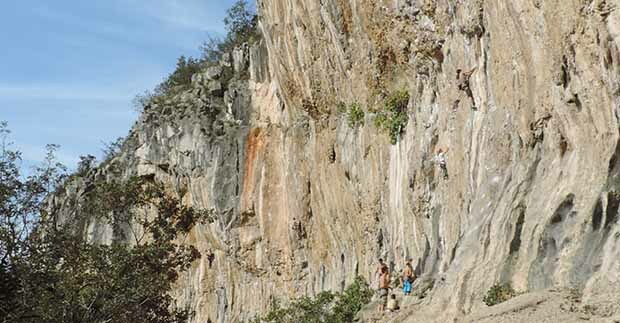 The Spider's roof in Osp is one of the premiere European destination for hard climbs. 55-meter monsters among the tufas are reminiscent of Kalymnos, but there are also many beautiful 7's on the edges which require much endurance. Many 150-m multipitches also start here and traverse the wall above. NAPOLEONICA is a huge area with the perfect views over the Gulf of Trieste and the city below. A road, closed for traffic was cut through the middle of the crag, making the approach and comfort unparalleled. The routes are perfect for beginners and intermediate climbers, but we can find some tougher challenges for the elites as well. COSTIERA is an example of a smaller crag, located right above the sea. 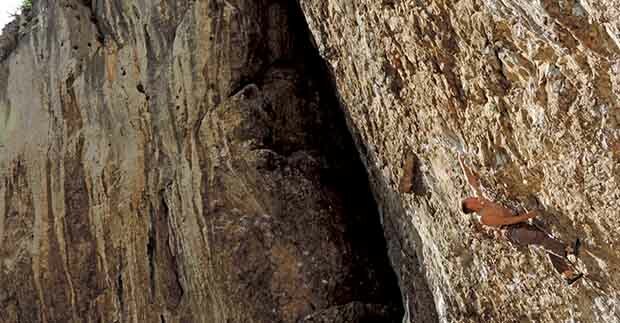 It offers a wide variety of routes for every kind of climber, with the long ones being especially interesting. Other such examples include the slabby Sistiana, scenic Aurisina or beginner friendly Doberdo. Each one is specific in its own way and can be visited based on your preferences and level. 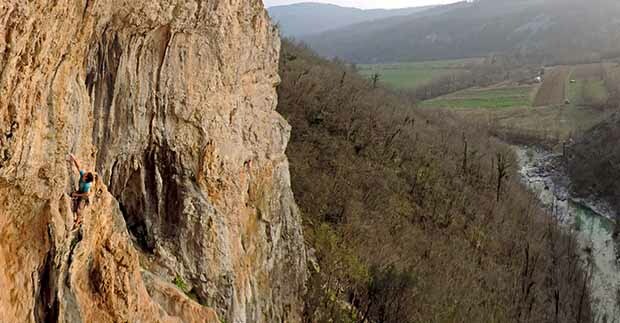 VAL ROSANDRA is a huge, historic collection of crags, located right between Trieste and Osp. A walking and biking path, using the abandoned railway, runs through this idyllic natural valley which begins with the waterfall. There are all kinds of walls here, with the number of routes that can last you a lifetime. Though most are suited for beginners, you can climb up to 8c here. 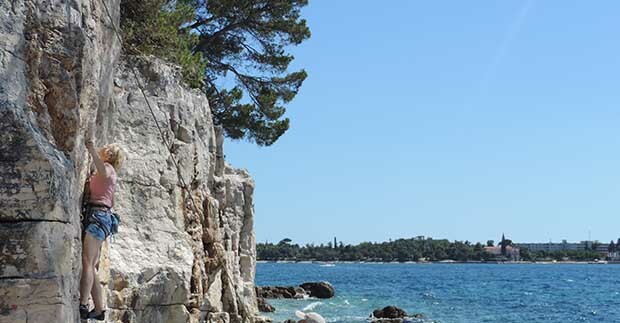 ROVINJ is a touristic pearl at the western coast of Istria, packed with visitors during the summer and somewhat sleepy for the rest of the year. Opposite the town is a beautiful peninsula, with beaches, avenues and orchards. And of course, a great climbing crag, located in an old quarry. It's a perfect place to chill and not exert yourself too much, as the hardest route here is 7a! LIMSKI KANAL is a special bay, reminiscent of Norwegian fjords. Luckily it's also full of great walls, that range from hard overhangs to perfect easy verticals near the sea. Those come in two pitches and can be done in one long piece or by learning to climb multipitches. The top of Lim bay is popular with tourists who come here for the view, but the crags are often very tranquil and lonely. 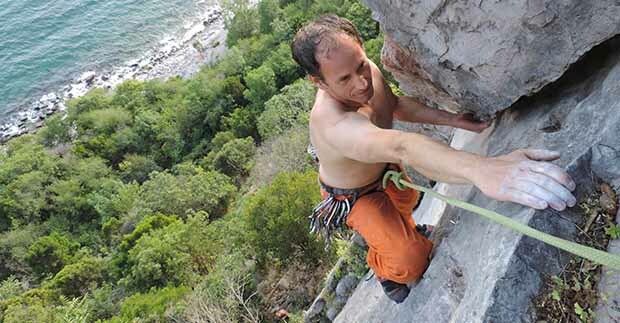 MEDVEJA is one of the newest crags on the eastern coast of Istria, made famous when Adam Ondra fired a first Croatian 9a here. The best sector is long, overhanging and filled with tufas, but you need a level around 7b to enjoy it. But don't worry - there are lots of other sectors for intermediate climbers and even one for beginners with 20 routes in 5s and 6s range. It's just one of many crags on the eastern coast that are all breathtakingly scenic and unique. KOMPANJ is another perfect crag, close to the Roc village. 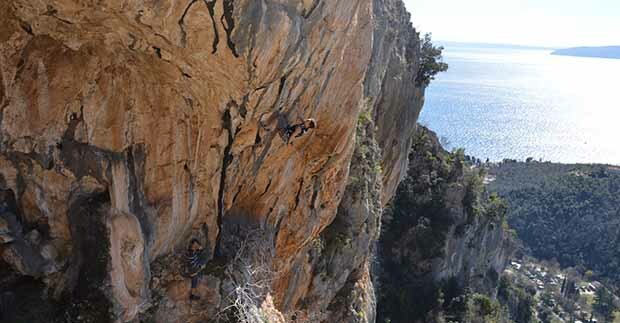 It's a long, uniform wall that stretches for several sectors, which include an overhanging cave, tufa-riddled endurance routes, or easier vertical ones, over 40 meters long. Anybody can find something for themselves here! This area is also full of smaller crags, each with a distinct character: a bouldery roof of Krkuž, an entertaining Rock'n'Roc and the scenic Raspadalica, which caters mostly to beginners. 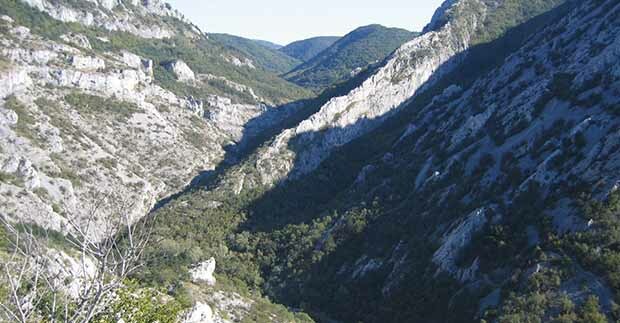 BUZETSKI KANJON is a crag located in two beautiful canyons close to Buzet town. It's got routes for everyone: easy and hard, vertical and overhanging, edges, pockets, tufas, slopers... you name it. It's climbable even in rain and has many walls in a nice shade if the weather is too hot. So basically, you can never miss. The area is full of excellent crags anyway: the beginner friendly Kamena vrata, crag with a thermal spa Istarske toplice or the wildest of overhangs Pandora.